Greetings bookworms and welcome back. Today I am bringing you an exciting new book review of Wolf by Wolf by Ryan Graudin, her newest book release and by far the best historical fiction novel I’ve read so far, telling the story of a strong young female in an alternate history where Hitler won WW2. Let’s get to it then, shall we? I knew this was going to be a 5 star read almost from the beginning. Everything about this novel screamed out to me and called for me, and as I read on, my opinions continued to solidify and now that I have officially finished it, I must say, I am absolutely blown away. I’m glad to have started off my year with this unique, beautiful and intoxicating novel. In my opinion, it’s nothing like you’ve ever read before – it’s a one of a kind-type story that you’d be missing out on if you decided not to read it, especially if you’re a historical fiction fan. I adored the premise of Wolf by Wolf, even before a copy of it landed miraculously in my hands. Just the mention of Hitler, the Nazi’s winning WW2 and the story of an 18-year-old girl with the power to shapeshift on a ride-or-die mission to kill Hitler gets my blood pumping. Who could possibly resist such an enticing premise? Certainly not me. And my, oh my, this book really lives up to the premise, in more ways than one. Through lyrical writing, three-dimensional characters that keep you second-guessing more than a couple times and a plot that drives you with a hunger to read on and know what the heck is going to happen and a keen eye for historical detail, this book was pure joy to read. Wolf by Wolf is a intricately woven historical-fantasy hybrid. Graudin’s attention to historical detail impressed me, as a fan of the time period, I could truly identify with many of the historical tidbits mentioned. While being a treat for history fans/nerds, it’s also still perfect for those not educated in the time period or for those not particular fans of the historical genre. There’s enough information in there that allows you to put yourself in that world and in that situation, without drowning you in facts, and I loved that. Couple this with Graudin’s writing – which was lyrical – and that makes a recipe for vivid imagery of the world within the novel. As Yael travelled to the checkpoints in the Axis Tour competition, the way each checkpoint is described sets them all apart and I felt myself moving through the checkpoints along with Yael and all the other competitors. Yael’s mission is what truly makes this novel as intoxicating as it is. If you read the blurb, it’s clear what’s going on – Yael is on a mission to kill Hitler, disguised as the face of the last Axis Tour winner due to her skin-shifting abilities. The plot is extremely well done and immediately grabbed my attention from the beginning and wouldn’t let it go. It’s not just a story about a race and a mission to kill a tyrant – it’s a story about immense strength and perseverance. The element of fantasy – Yael’s ability to shapeshift – was woven well within the story. It didn’t feel out of place among the rest of the story and neither did it feel too much like a fantasy story. It was just a small element that added more excitement and it was explained in a logical, believable way. 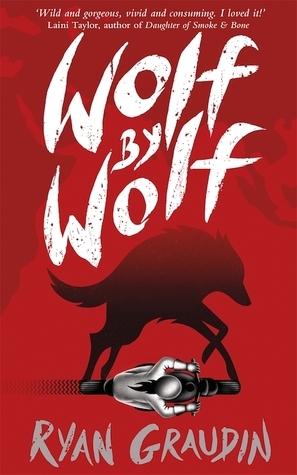 I consider Wolf by Wolf as a novel that is very much plot driven, however, one of the things I loved about it is that, Graudin not only presents an invigorating plot, she brings in complex, three-dimensional characters. Yael is an incredible protagonist. She’s extremely strong and brave and years of growing up in the hardships in the Hitler era hasn’t broken her, instead it has sharpened her into a stronger, more powerful woman and this is seen through Graudin’s way of writing the story – although we don’t see straight into Yael’s mind as it is in third person, it switches between Yael’s past and present, giving meaning to Yael’s thoughts and actions as the story progresses. I thought this was absolutely beautiful and Yael’s story is heart-breaking. The more I think about it right now, the more I feel like crying. It’s not just Yael who is so well-built as a character. The supporting characters, such as Felix and Luka are the same. In third person limited, you get no glimpse into any of the other character’s minds. You only know what Yael knows about them, and she doesn’t know much. This made it riveting to see Yael ride alongside these people and try to fill in the holes of memories that they shared with the face that was not her own. There is never a dull moment in Wolf by Wolf. It’s all intense action and angst. You’re never sure of what’s going to happen, and it gets even harder to tell whether Yael will succeed as her mission gets more and more complicated than it should be. I appreciated Graudin giving a glimpse into the life some people had during the time period – those who were persecuted by Hitler and sent to concentration camps. Although there was only a glimpse into that, I really appreciated that. Wolf by Wolf, to me, felt like a story about identity in a world ruled by a tyrant who only wants people to a certain appearance and stature. When you must conform to the standards of appearance or otherwise face death, will you remember who you are? Will you lose yourself in the process? These were questions that arose to me as I read Yael’s journey. Overall, Wolf by Wolf is a phenomenal, enthralling piece of work. It’s a historical fiction novel with a hint of fantasy that you can’t take your eyes off because you’ll crave to know what is going to happen next. I recommend everyone to read it, because if you don’t you are most surely missing out! Have you read Wolf by Wolf? If not, are you thinking of picking it up? This entry was posted in 5 Star Rating, Book Blog, Book Reviews and tagged Alternate History, book review, Historical Fiction, Hitler, Ryan Graudin, Wolf By Wolf, WW2, YA, young adult. Bookmark the permalink. Yes yes yes! It’s such a good book, it was absolutely thrilling and fantastic! Agh, yes let’s fangirl over this book together. This sounds sooo amazing and I can’t wait to get back into it. I only read the first 50 pages because I had to finish applying for my masters degree (which takes forever ugh haha), and then I got my copy of Truthwitch so I wanted to read that first… but, your review is making me really excited to go back to Wolf by Wolf, the characters and plot is so intriguing. Fantastic review, Josie – so glad you loved this! This is a great review! I didn’t realize it went back and forth between the main characters past and present, that makes it sound even more interesting. I am definitely picking this up soon, it’s been on my bookshelf for a little while now. Thank you, Gabi! I’m glad to hear you’re picking it up, it’s definitely a great read. The switching back between past and present really adds a great touch to the entire story, and it really packs a punch! Yael really was an outstanding character. Felix made my heart feel all warm and fuzzy! Between him and Luka, they come close to a tie for me. WOW! I knew nothing about Wolf by Wolf before reading your review. Now its moved up to a must read. That sounds incredible. That’s great! Yes you just read it, I’m sure you will love it, it’s very different and it’s written so well. I definitely want to check this book out! The whole concept just really boggles my mind and I’m interested in seeing how Graudin plays it out. Awesome review; you’ve made me want to read it more! This sounds like a truly wonderful book. I have heard nothing but great things about this one from all of my most trusted reviewers so I cannot wait to read this! It’s calling to me from my shelf right now. I think you’ll definitely enjoy Wolf by Wolf! Oh and it’s actually a ‘her’. I still haven’t read her debut, but I’d like to very soon, after being so impressed with Wolf by Wolf! I’M SO HAPPY YOU READ THIS! I loved this book as well, I’m desperate for the sequel! Your review basically summed up all my thoughts. Not a huge fan of historical stuff, but this sounds pretty interesting. Beautiful review! I’m totally going to give this a shot. Beautiful review Josie! I love how you went into the details to describe what an amazing book this is. I’ll definitely keep my eye out for this one–having read a wonderful historical fiction recently I’m really looking forward to more books from this genre. Thank you Tanaz, I really wanted to give this novel the appreciation it deserves, because it was just that awesome. Great review! I absolutely LOVE this book. Definitely one of my faves from 2015. I recommended it to both my husband and his brother (and we all have VERY different reading preferences) and they both loved it as well! I feel like it’s so well written and has a very wide range of appeal. Thank you! It’s definitely a book that I think almost everyone will enjoy. It’s just so GOOD. You’re so right, it’s definitely got a wide range of appeal. I’m so glad to hear you enjoyed this book, Jose (not José)! The story sounds like it straddled the Hist-Fic/Fantasy genre line quite nicely and that’s totally something I could see myself reading (note: plain Hist-Fic is such a doozy for me to find interest in reading). Though I’m probably gonna finish The Walled City first before getting to Graudin’s second novel. Trust me, I think you’ll enjoy this one! The historical side of it is definitely not boring at all. I must make a note to pick up The Walled City next while I wait ever so patiently (lol, not really) for the sequel. Awesome review! I cant wait to pick this book up! Thank you! I’m sure you will love it. It’s pretty incredible.